Royal Caribbean’s latest cruise ship, Harmony of the Seas, will be the first in the fleet to début Splashaway Bay, an interactive aqua park for kids. 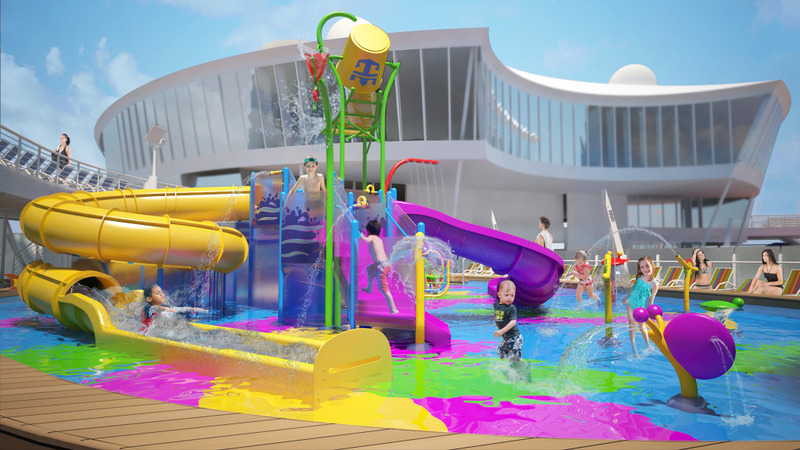 Splashaway Bay will be a vibrant water-scape for kids and toddlers with sea creature water cannons, winding slides, a drench bucket and a multi-platform jungle-gym. This area will be installed instead of the H2O Zone that currently exists on sister ships Oasis of the Seas and Allure of the Seas. The 227,000 gross ton ship, which will come the world’s biggest cruise ship when launched next year, will also feature the tallest slide at sea with a dramatic 10-storey, 30 metre (100 feet) plunge. 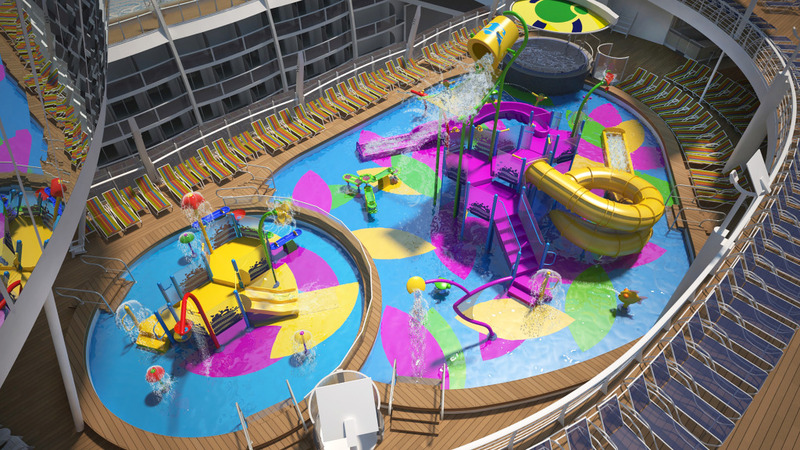 Riders of the Ultimate Abyss dry-slide will start in the Pool and Sports Zone at the aft of the ship and end in the Boardwalk neighbourhood below. 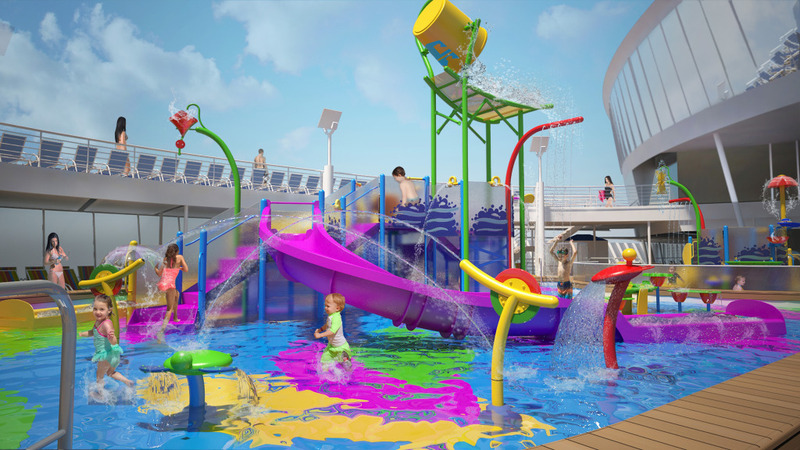 This is in addition to the three previously announced water slides known as “The Perfect Storm”. Typhoon and Cyclone are racing slides while Supercell is a bowl slide. 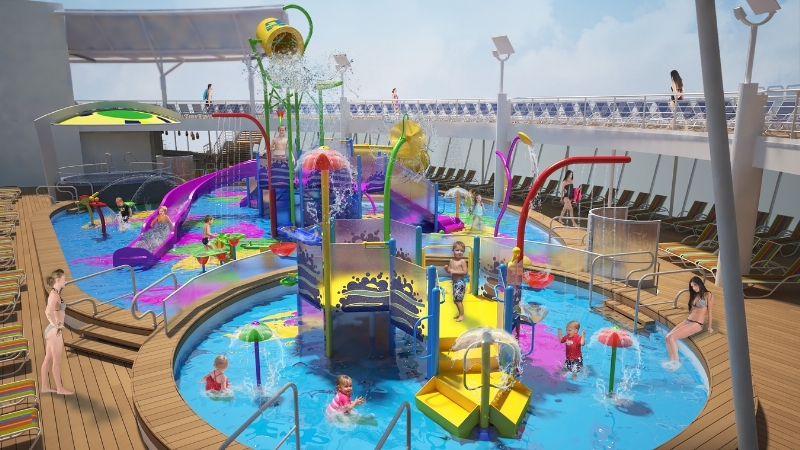 Harmony of the Seas will offer the same seven distinct neighbourhoods as found on Oasis-class ships including Central Park, Boardwalk, the Royal Promenade, the Pool and Sports Zone, Vitality at Sea Spa and Fitness Centre, Entertainment Place and Youth Zone. Revolutionary features from the Quantum-class will include the Bionic Bar dancing robot bartenders on the Royal Promenade; Virtual Balconies in many interior staterooms offering sea and port views; the Royal WOWBands with RFID technology to simplify the guest experience; and VOOM, the fastest internet at sea found. While the classic dining model will be available a number of new speciality restaurants will be offered including Izumi Hibachi and Sushi; Sabor Taqueria and Tequila Bar; and Wonderland Imaginative Cuisine. 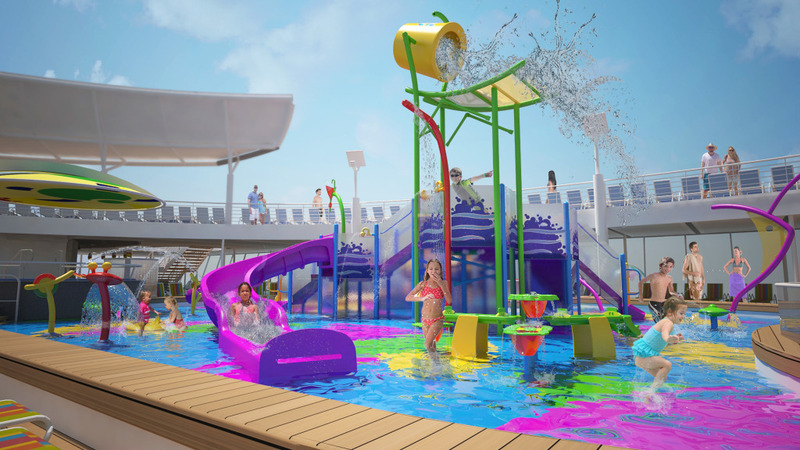 Harmony of the Seas will be the first in a new generation of Oasis class ships and feature a fusion of the best and most innovative aspects of both the Oasis-class and Quantum-class of ship. She will launch in May 2016 and will sail on seven-night Western Mediterranean itineraries calling at Barcelona, Palma de Mallorca, Spain; Provence, France; La Spezia (for Florence/Pisa), Civitavecchia (for Rome) and Naples, Italy during her maiden season. Prior to launching the ship will also briefly call at the port of Southampton.